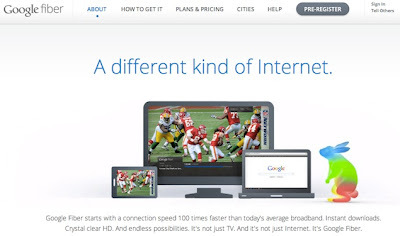 Google Fiber: 10 things to know about the 1000Mbps Internet service ! Google Fiber made a big splash upon launch, with its promise of Gigabit speeds at the cost of regular broadband. Google announced that it will be launching its fiber-based Internet service in Kansas City, USA. The service will let users download unlimited Internet data at the speed of 1000 megabits per second for $70 per month. The Internet search giant had received 3,900 registrations for Google Fiber as on Sunday, with users having another 41-days to pre-order. The installations will begin in September. Here's all you need to know about Google Fiber. Every customer who signs up for Google Fiber with TV will get a free Google Nexus tablet to use as a remote. As of now, it is not clear whether it will be the 8GB model of Nexus 7 or the 16GB one that will be provided but nevertheless it is a great deal. There is also speculation that with the subscription of Google's Internet one may be able to get a ChromeBook for a discounted price of $299. The TV + Internet plan costs $120 per month, against $70 per month for Internet only. Apart from the speed, what is exciting about Google Fiber is that it is offering unlimited data uploading and downloading. Yes, that's right. There are no star marks or caps that the company plans to put on the amount of data you transfer. Google Fiber TV also comes along with a DVR box that lets users record as many as eight channels simultaneously. There is also an on-board memory of 2TB to help store all data that one may want to save. Google is charging $300 as an installation cost for this service and everyone who wants to pre-register will have to pay $10 to make a request. One would need at least 50 neighbours to make a request for Google to install this service in their area. For areas in Kansas, which still do not have broadband access (about 25 percent of the area), Google is offering 5Mbps download speeds and 1Mpbs upload speeds for the next seven years on payment of $300. Google Fiber offers 1Gbps download and upload speeds. In a world where upload speeds are capped at rather ridiculous levels, that must be music to the ears of end users. Torrent-ers rejoice! The Internet Service Provider (ISP) business is a new vertical for Google and given that it has little expertise in a consumer facing business, it will be interesting to see what it's strategy will be for this vertical. It will be a challenge even for Google to establish a robust customer service mechanism. The plans shared so far are clearly targeted at the home user, so what about the business users? Will Google continue to ignore them or will it have special plans for businesses in the future, remains to be seen. 10) India? Forget about it! In India, where most are struggling to get even a steady 1Mbps line, a service like Google Fiber will be really welcome. But given the state of infrastructure in our country and the amount of investment that setting something like Google Fiber will entail, we wouldn't advise you to hold your breath.